Aloe Vera is edible. Learn how you can cook and eat Aloe with this poached aloe recipe. We’ve all heard of the miraculous feats that Aloe Vera performs on injured or sunburned skin, but did you know that Aloe is also edible? While you only really see it being sold as a juice in healthfood stores here, in Japan, it’s quite common to see it added to beverages and yogurt. 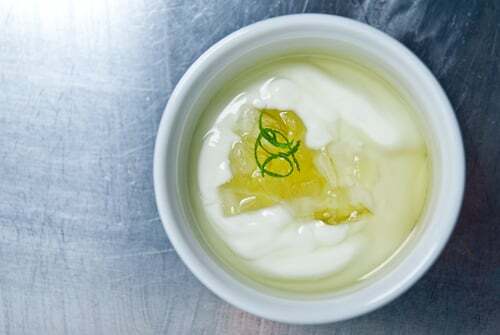 It’s one of my favourite things with yogurt (up there with passionfruit), and I love the slightly green taste and the quivery cubes of aloe that have the texture of resilient grapes. Realizing that I may be waiting a long while for Dannon to start offering little cups with aloe on the bottom here in the States, I decided to take matters into my own hands. I’d seen aloe being sold at Essex Market before, so I made the trip out and picked up two long spears of aloe at the produce place. If you don’t have aloe growing in your back yard, you can probably find it at a Latin American grocery store. Because some people are funny about textures, I should warn you that raw aloe is extremely slimy. Think okra x10. Cooking it reduces the slime factor considerably, but it does still have a viscous slippery feel to it. 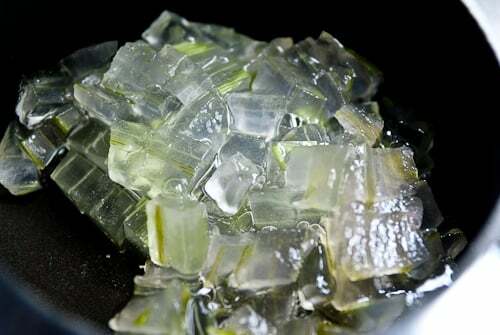 Cooking the aloe will give off a ton of liquid and the cubes will shrink and soften without losing their shape. On a bowl of plain yogurt with a bit of lime zest, poached aloe makes for a light refreshing breakfast and a great way to start the morning. Because the aloe is very slippery it is hard to peel, but it's important that you get all the fiberous green peel off the aloe as it is tough and bitter. Chop the aloe into small cubes and add to a small saucepan along with the sugar and lime juice. Cook the aloe over medium low heat until the liquid is no longer slimy and the cubes have the texture of resilient grapes. Allow to cool and serve over plain yogurt. If your lazy like me, you can also purchase canned pieces of aloe at Trader Joes. I just pop a can open and drop a couple spoons of it in my yogurt. very, very interesting. who knew – of course it would be you that would teach me this. i would actually imagine it to be quite slimy. this seems like an easy enough recipe. but more importantly – what the heck does it taste like? slightly green taste – hmmmm… does it taste grass-like? chive-like? curious for you to explain further. Well, you certainly learn something new every day, on No recipes! It looks a bit like nata de coco. Is eating it meant to be good for you as well? Oh! They held their shape pretty well. I’ve never eaten aloe before, but it seems way slimier and softer here. I wonder if the gel is protein or polysaccharide– and if there’s a way to harness it somehow? Anyway, I might give this a shot (though I’ll probably be the only one eating it here, heh). It does look nice and refreshing! My grandma used to grow aloe and we used it for medicinal purposes but I had no idea it could be edible! How unique! I am so curious to try it! Awesome! I loved, loved, loved the aloe yogurts and drinks in Japan, and I wondered at the time how the aloe was prepared. Can’t wait to try this at home! A good friend of mine has always drank the juice, and juices it herself. I just saw Aloe at the market, and wondered what to do with it in cooking, this is great! You are very informative and I enjoy coming over here to read! Interesting indeed. I have never tasted aloe before, but I always thought its texture would be similar to konnyaku – I guess not. Perhaps it’ll be a fine addition to a cocktail as well? It’s hard to really compare the flavor to anything, but I suppose it’s like something between green grapes and cucumber. Well it has a bunch of vitamins and minerals before you cook it, but I’m not really sure how cooking it changes the nutritional content. Doesn’t it smell fuunky? The aloe here does, I could not imagine eating it. Leave it to you to come up with something unique again. Fresh aloe just has a very strong taste if it’s not cooked, so I’m not sure if you could get around it by juicing it yourself. Smoothies are probably the way to go there. Great idea. I’m not sure you’d want the chunks in it, but the syrup would be fantastic in cocktails. Maybe with a some lime or mint! Hello. I used to put aloe in my hair before (I agree with the 10x slimy) and I’ve had aloe drinks in Hong Kong two years ago with little gels in it.I haven’t tried eating aloe straight from the plant though, and i am very curious. Lots of them in my mother’s garden :)- but are there only certain types of aloe that are good for eating? Wow. You could really take this recipe places! So simple. Us asians love this type of texture! And grass jelly! Ooooh, can you make a grass jelly drink? That would be so good. My grandmother (who was Japanese) used to take big chunks off the aloe plant in our house and just crack it open and eat the contents. She swore by it! Growing up, aloe was the go-to cure-all in our family. I love aloe vera! Wonderful use of it. Very cool idea, Marc! I wonder if they’d be easier to peel and deal with if you freeze them first? Never worked with aloe, so I’m not sure freezing would change the texture. It does have a mild smell, but I’m not sure I’d call it funky… Maybe your aloe is a different kind? According to Wikipedia, “aloe vera barbadensis miller” is the type most commonly used for juice. It sounds like there are other edible varieties though. I always find fresh aloe in the wet market but never have the chance to try it out. This recipe is simple enough for me to “digest”. Hehehe! How do you choose a good aloe? How interesting about the aloe. I’ve never had it like that. But those little quivering jellies sure look pretty and welcoming. I’m also thinking this might be divine as a pate de fruit. I’ve seen giant aloe leaves for sale at the grocery store and contemplated them (mostly poked them). Since I (sometimes) make my own yogurt I’ll have to try this at some point. I bet it’d be really nice in the summer, since aloe suggests cooling. Maybe as a frozen yogurt?